Cleanse your face while retaining essential skin moisture with the Innisfree Green Tea Pure Cleansing Foam from Korean famous cosmetics brand, Innisfree. Enriched with green tea and green tea complex, this effective cleansing foam deeply cleanses pores removing all traces of makeup and impurities. Because of its moderate consistency, it is easy to control how much you want to squeeze out. It lathers up easily and its rich lather beautifully clears away dirt. It effectively clears dead skin and sebum for an oil-free skin. It rejuvenates dull and tired skin by moisturizing it, thereby giving you a healthy and bright skin tone. 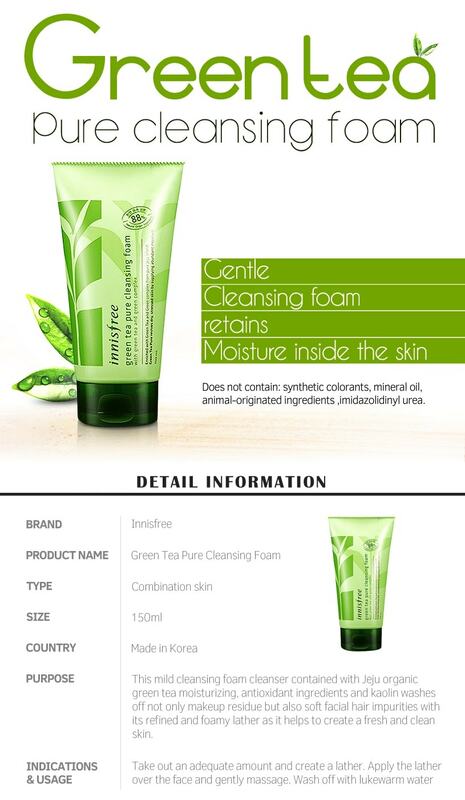 The Innisfree Green Tea Balancing Skin is a famous Korean cosmetics product that is especially suit.. The Innisfree Green Tea Balancing Lotion from Korea is specially formulated to smoothen and soften ..
Have an awesome cleansing time with this Green Tea Cleansing Water from Innisfree! This Korean skin.. Description: A cleasing oil that is very gentle to the skin and at the same time it deeply cleans..